Instant Pot Minestrone Soup | Easy & Delicious Minestrone Soup Recipe! Instant Pot Minestrone Soup is the perfect hearty meal to warm you up. This homemade recipe tastes just like the Olive Garden version and is loaded with healthy vegetables and hearty beans. Cold weather days call for lots of soup. I love soup season since you get to throw in a bunch of random ingredients together and call it dinner. Classic minestrone is one of our favorite soups that we make regularly. But you know what? I think I may love this Instant Pot Minestrone Soup the best. We love our Instant Pot and I couldn’t wait to try out a few classics like rice, pasta, chicken, hard boiled eggs, stew and this soup in it. And in case you don’t have an Instant Pot, I’ve even included directions for an easy minestrone soup made on the stove-top. 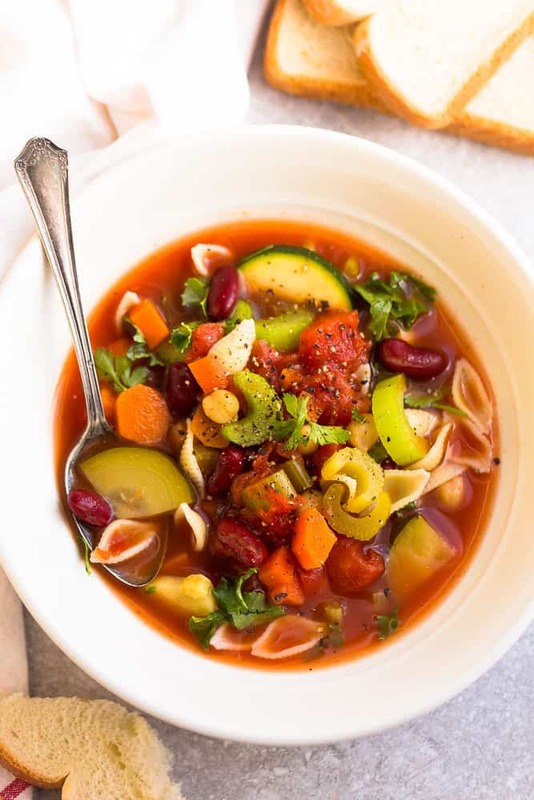 With this Instant Pot Minestrone Soup, you get all those rich and deep flavors without having to simmer in a pot for a few hours. It’s a super easy set and forget meal that’s hearty, filling and always hits the spot on a chilly winter day. 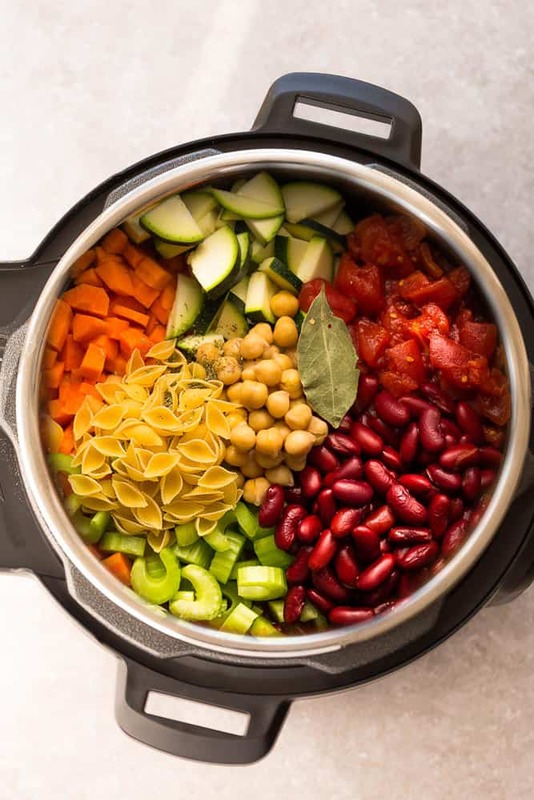 WHAT INGREDIENTS DO YOU NEED TO MAKE INSTANT POT MINESTRONE SOUP? For this recipe, we use dry pasta shells that get cooked directly in the Instant Pot to make this an easy one pot meal. Also, if you plan on freezing this soup, I would leave out the pasta and cook it separately on the stove whenever you’re planning to serve it. That way, the pasta doesn’t end up getting soggy. Next, press the SAUTE button on your instant pot and drizzle in some olive oil. Add the onions and garlic and cook for about 2 minutes, until fragrant. Add the carrots, celery, basil, oregano, thyme, diced tomatoes, tomato paste and bay leaf. Stir in dry uncooked pasta, vegetable broth, water (use less if you like it less watery) and season with salt and pepper to taste. Press Cancel then close the lid. Press the MANUAL (older models) or PRESSURE COOK (newer models) button and set for 2 minutes. When the instant pot beeps, do a quick release by turning the valve to venting to release the pressure. Once the pressure is released, press cancel and push SAUTE. Stir in the kidney beans, cannellini beans and zucchini and cook for 5-6 minutes, or until pasta and beans are tender and cooked through. Stir in spinach and allow to sit until wilted (about 1 minute). Add more water as needed if you like a thinner soup. 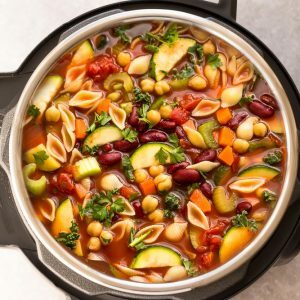 IS INSTANT POT MINESTRONE SOUP HEALTHY? Soup is always a healthy choice when it’s packed with a ton of vegetables. 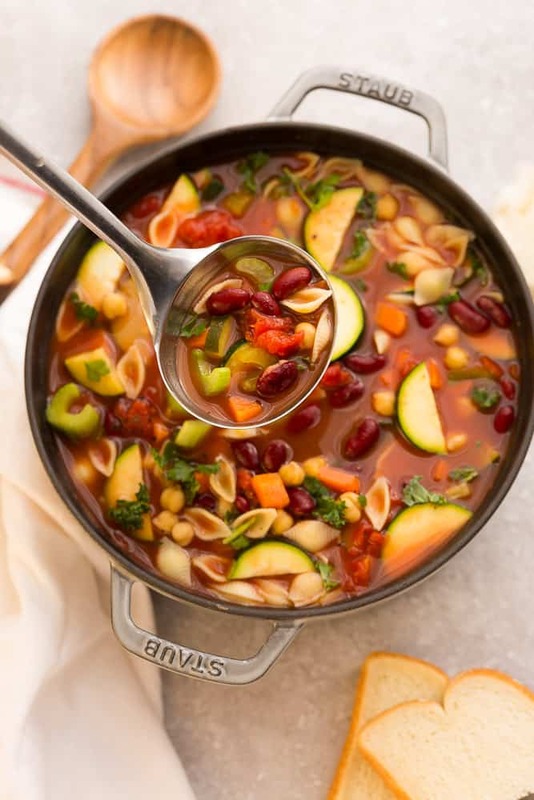 This instant pot minestrone soup recipe is full of fresh vegetables and legumes. It also contains tons of vitamins, protein and fiber. Plus, it works if you’re vegan and gluten free if you use a gluten free pasta. CAN I HAVE MINESTRONE SOUP IF I AM FOLLOWING A WHOLE 30, PALEO OR LOW CARB / KETO DIET? To make keto minestrone soup, low carb minestrone soup or a whole 30 / paleo minestrone soup, simply leave out the pasta, beans and carrots and add cauliflower and green beans instead. Yes! 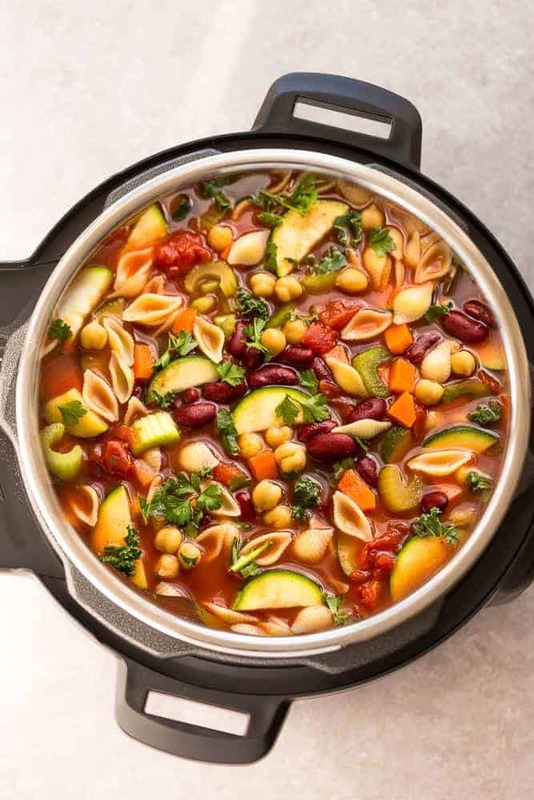 If you plan to freeze this instant pot minestrone soup or serve it the next day, simply leave out the pasta and cook on the side. Stir in the pasta to combine just before you are ready to serve. This helps the pasta not get soggy. 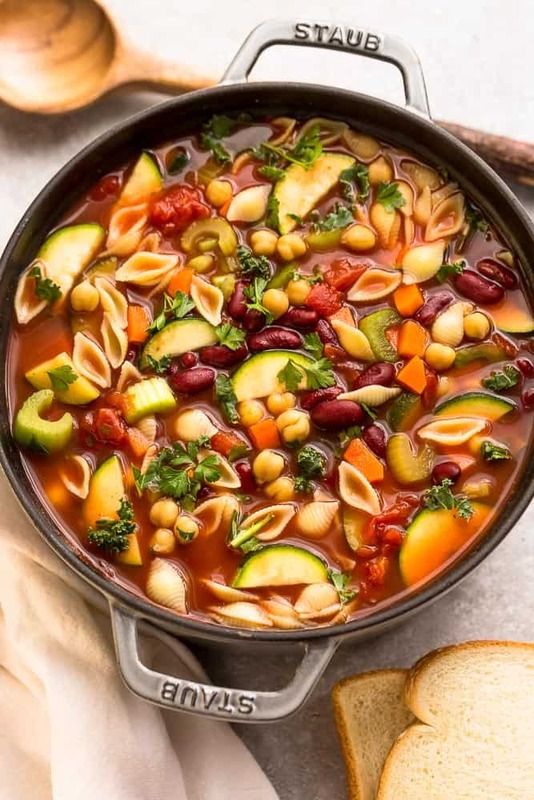 WHAT CAN YOU SERVE INSTANT POT MINESTRONE SOUP WITH? Serve this delicious soup with a side salad, crusty bread and dig in! Instant Pot Minestrone Soup is the perfect hearty meal to warm you up. Best of all, this homemade recipe tastes just like the Olive Garden version and is loaded with healthy vegetables and hearty beans. Press the SAUTE button on your instant pot and allow to heat up for 2 minutes. Add olive oil and saute onions and garlic for about 3 minutes, or until fragrant. Add the carrots, celery, basil, oregano, thyme, tomatoes, tomato paste, bay leaf, vegetable broth, water and dry pasta. After the soup has finished cooking for the 2 minutes and the instant pot beeps, do a quick release by turning the valve to VENTING to release the pressure. Once the pressure is released, open the lid and add zucchini, kidney beans and cannellinibeans. Press the SAUTE button and cook for another 5-6 minutes, or until the pasta and beans are tender and cooked. Stir in spinach (kale) and allow to sit until wilted (about 1 minute). Add more water as needed if you like a thinner soup. Add basil, oregano, thyme and cook for an additional 1 minute. Add the tomatoes, tomato paste, bay leaf, vegetable broth, water, kidney beans and cannellini beans. Stir in the dry pasta and zucchini and cook for another 10 minutes, or until pasta is tender and cooked. Stir in the spinach (kale) and allow to wilt (about 1-2 minutes). Add more water as needed if you like a thinner soup. NOTE about pasta - **If you plan to freeze this or serve the next day, leave out the pasta and cook on the side and then combine when you are ready to enjoy. This helps the pasta not get soggy. This came out amazing! Thank you! Love this soup!! I could eat it every day! THIS TASTES GREAT. I ADDED 3/4THS CUPS OF THE BEANS AND HALF A CUP OF NOODLES, THOUGH. OTHERWISE IT’S LIKE EVERY PERSON HAS THREE BEANS AND A NOODLE FLOATING AROUND IN THEIR BOWL! I’LL DEFINITELY MAKE THIS AGAIN THOUGH! I really liked this recipe with some tweaks. I use two 15 oz cans of cannelini. also don’t waste the bean liquid! you’re making soup so don’t rinse the beans, throw all that goodness in there. it’ll add flavor as well as giving the broth a little body. Made this on the stove and it turned out really tasty! Used 1/2 orzo and 1/2 pasta. One question: the directions mention rosemary but the ingredients list doesn’t. at What time could kale be added to the mix? At the begining or the end like spinach? Made it with a few modifications and my husband said it was great! although this was after a long day of plowing snow. My family eats meat so I added sweet italian sausage to the recipe. it tastes amazing!! i will be making this recipe again!! Yum! My family thought this was SUPER tasty! A keeper! I like using pearl barley instead of pasta. Reheats great! I’m so glad you mentioned using barley! I like it so much, but didn’t think about it for this soup; i’ll definitely have to use that, because there being only me to eat it, I’ll need to freeze most of the soup, and I’d like to be able to just thaw, heat and eat without having to make pasta each time. i’ve Never had olive garDen soup so i can’t comment on that piece, but this recipe was Very good. I made the StoveTop version. I only had 20 ounces of diced tomAto and they Had green chilis in them. I was nervous to use but it was honestly really good and added some spiciNess. I also used elbow macaroni. I didnt have cannelloni beans and used garbonzo instead. Will definitely make this again. I don’t know why this is in all caps. My caps lock is off-so sorry about that. I deeply appreciated this soup. i have kidney failure and I need low sodium recipes and I was able to keep this low sodium. It is the first soup that has had any flavor(usually lo-so soups smell great and taste like water). I was generous with my spices and i also added lemon crystals. Otherwise i used all low sodium or no salt added products and it was great. Thank you. This was freaking amazing! Thank you! I made this last evening using my 6 quart Duo (I have two) IP, it is sensational! In addition it reheats well in the microwave. The Balsamic vinegar raised the flavor one notch higher. This is a definite do-over, thank you this great recipe.